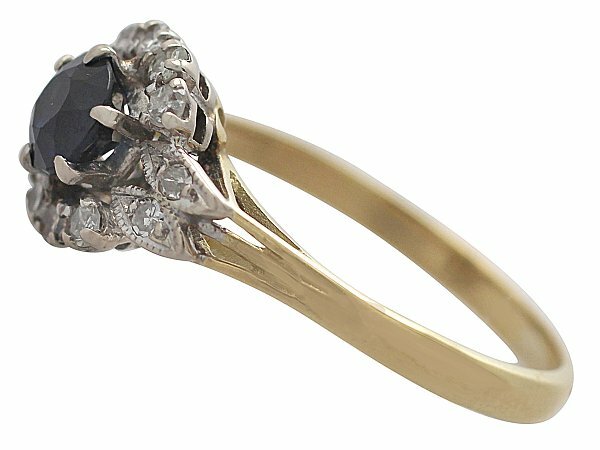 This impressive vintage sapphire ring has been crafted in 18 ct yellow gold with a platinum setting. 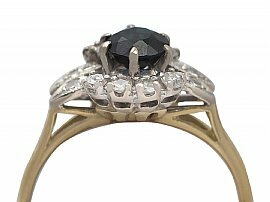 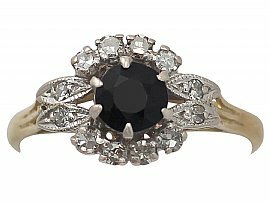 This dress ring displays a feature 0.60 ct old round cut natural sapphire, claw set in relief to the centre of the platinum pierced decorated, shaped frame. The unusual design displays eight individually claw set eight-cut diamonds to the upper and lower borders. A further four, eight-cut diamonds are individually claw set in millegrain decorated paired elliptical designs that embellish the elevated pierced decorated ring shoulders. 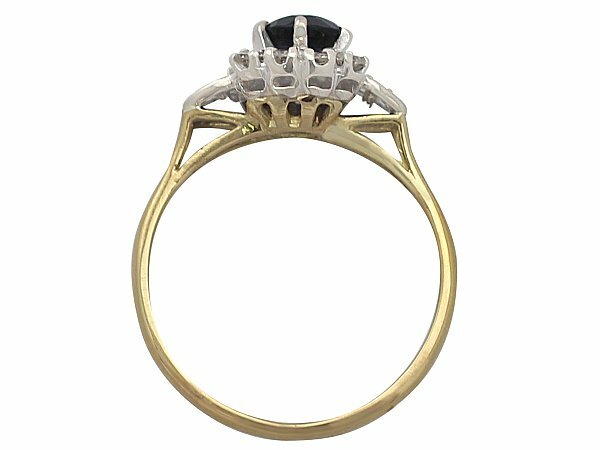 The substantial frame pierced with a series of triangular apertures blends seamlessly with the plain hallmarked yellow gold shank. 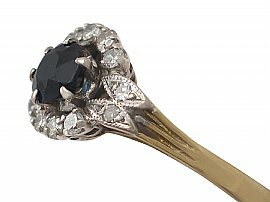 The hallmarks to the interior of the shank include the Birmingham Assay Office mark (anchor), the 18 ct guarantee mark (18), the gold guarantee mark (crown), the maker's mark (C.P.S) and the date letter (rubbed). 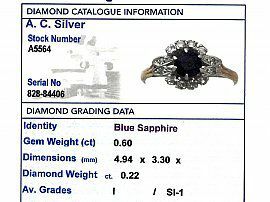 This vintage sapphire and diamond yellow gold ring is supplied with an independent diamond grading report card. 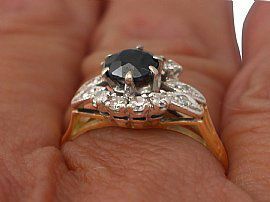 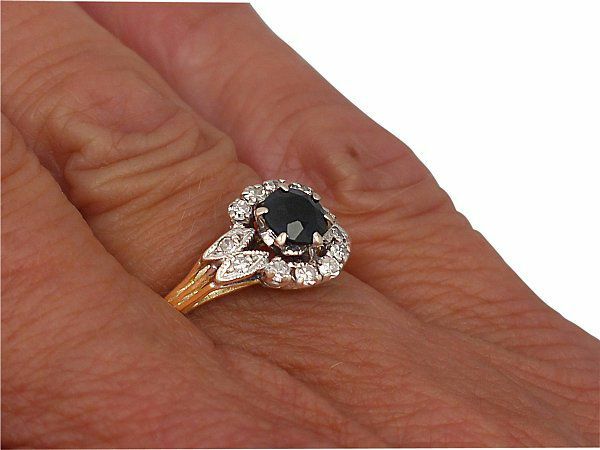 This cluster ring is very good quality, set with a natural blue sapphire and old cut diamonds. 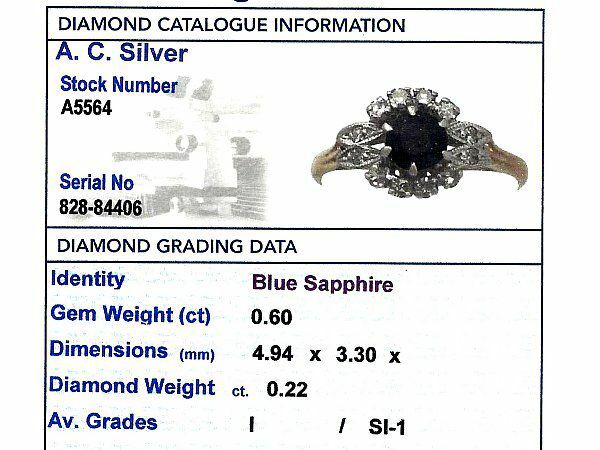 The sapphire and diamond yellow gold ring is a good gauge of gold and is in excellent condition, the hallmarks to the interior of the shank are very clear apart from the date letter mark and Birmingham Assay Office mark (anchor) which are rubbed. 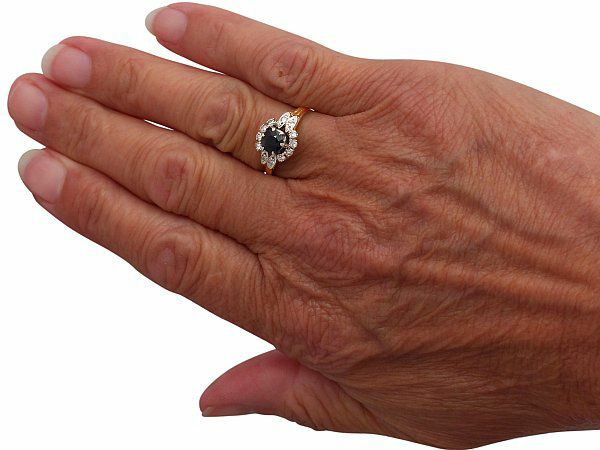 Length of setting 1.3cm / 0.5"
Width across setting 8mm / 0.3"